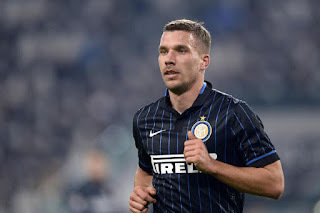 Arsenal striker Lukas Podolski is the subject of a £1.5million offer from Turkish side Galatasaray as the Germany international eyes regular football. The 30-year-old, who has one year remaining on his contract, made just 13 appearances for the Gunners last term before spending the second half of the season on loan at Inter Milan. Podolski’s future in north London remains uncertain and the Turkish champions’ manager Hamza Hamzaoglu recently revealed the club are interested in a potential deal. ‘Podolski and (Andre) Gignac are both on our shortlist,’ Hamzaoglu told NTV Sport. The former Bayern Munich forward had previously revealed he was open to a return to the north London club following his unsuccessful spell in Italy, where he scored just once. However, it seems his stance has changed after admitting he could leave the club if he can't get regular football at the Emirates.